Webcam watchers will have seen the birds endure a rather wet and windy week from the 11th to 17th March, courtesy of Storm Gareth. As a species which has evolved over millions of years and found it’s niche nesting on cliff faces, Peregrines are well used to windy conditions but it was hard not to feel a little sympathy for them last week as they got blown about. The female shifted about from perch to stone ledge to nest platform but didn’t seem to get much respite anywhere…. the downside perhaps of the commanding viewpoint they call home each spring. At one point one of the birds, almost inevitably, tried the camera out as a perching point so we got a view of not very much for an hour or two. And when it left the raindrops didn’t make the view much better either. Thankfully things have calmed down a bit now although you can still see the breeze up at the top of the tower from the way it displaces the bird’s feathers when sat on the perch. March 18th marked the first day of 2018 with 12 hours and 1 minute between sunset and the days are longer than the nights from now on until September. A highlight of the astonomical calendar. Let’s hope the lengthening days bring warmer temperatures and settled weather. The fact that the birds stay and endure the elements as they did last week just goes to emphasise the strength of their instinct to sit tight and protect their territory. There will other perches around city’s skyline which offer a more comfortable perch in the lee of the wind and perhaps this was where the male was at times last week when not on camera. The combination of the site, the bird’s renewed pair bond and perhaps their sense of their previous success mean the instinct to stay put is unbending. The birds will have looked cold, wet and miserable to human observers last week as we view the birds in our own terms but it’s a testament to the amazing natural technology of feathers that they stay warm and dry. If the feathers didn’t work so very well the birds would perish in such harsh conditions. The tightly interlocking barrier the outer feathers form is aided by oil from the preen gland gives excellent water repellency to keep the rain out. Downy feathers closer to the skin keep the warmth in. So today is 19th March, the earliest date on which the first egg has been laid in recent years. Time to start watching closely! In 2018 the first egg was laid on 22 March, which is a more typical average date. The female has made a bigger depression in the gravel ready for the eggs so it would appear that the time is nearly upon us. However, we saw less bonding activity last week due to the weather which, for no scientific reason whatsoever, makes me think we might have to wait a day or two yet. What do you think? Keep watching to find out…. Heading into work or classes this morning? You’re being watched from on high. Smashing image of one of our birds on perch in first light. Well it’s that time of year again. 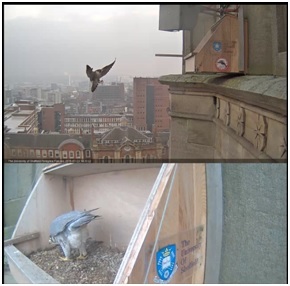 Welcome back to the Sheffield Peregrines blog. There have been regular winter sightings of the birds all around the City Centre, the top of the University Arts Tower continues to be a popular spot, over the Wicker arches and Pitsmoor regularly too. Since the mid to late January the Peregrines have been frequenting St. Georges Chruch more and more, beginning the process of re-establishing their territory and guarding this prime piece of Sheffield real estate from the wandering eyes of any passing Peregrine looking for a room with a view. The birds became a daily fixture as February drew on and the temperatures rose, clearly enjoying the unseasonably warm and sunny weather and towards the end of the month a bird could be reliably spotted on station on the camera perch late afternoon each day and some days for much longer periods. The female has been in the nest platform itself from time to time, reacquainting herself with her surroundings. There’s been the odd bit of courtship too. If you do see anything interesting happening with the birds be sure to Tweet @peregrines2019 as the bloggers and Twitter admins are unable to monitor the cameras 24/7! What a great view it is to see a bird on the perch with blue skies and the cityscape behind, perfectly lit by the setting winter sun. (Thanks to @suenaylor for the screen grab) It’s a great view for us and no doubt it must be an advantageous one for the birds too given their continuing success at St. Georges since 2012. 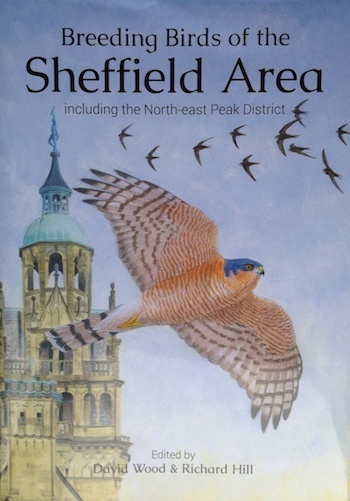 Success which is underlined by winter sightings of previous Sheffield Peregrine offspring. Our 2014 male fledgling is once again in residence with his partner in Wakefield and the 2018 chick (Orange leg ring ‘PSA’) has been spotted several times in the Dearne Valley east of Barnsley including at RSPB Adwick Washlands and around the Manvers trading estates which neighbour the RSPB’s Old Moor reserve. It’s great to know this bird is alive and well and fending for itself and it’s fascinating to see which direction it has dispersed in. Perhaps even more so given that Old Moor already has long-standing resident Peregrines which hunt over the pools and scrapes for wildfowl and waders and regularly perch on the electricity transmission pylons there. Do look out for ‘PSA’ if you are visiting the Dearne Valley and report any sightings to @peregrines2019 and @shefbirdstudy with location time and date and any photos if you have them. Here’s a photo of PSA posted on Twitter by @StonesGary – nice work Gary! Will PSA establish a long term home in the Dearne Valley or be chased out as the more experienced resident birds begin to think about breeding? None of this information would be known of course without ringing the birds or without everyday people like YOU, readers of this blog who take interest in the birds and report their sightings. Chicks from the last 2 years clutches have big bright orange leg rings which (given a bit of luck) can be read by anybody with binoculars, a telescope or telephoto lens, and a bit of patience. So anybody can take part and contribute to the knowledge and understanding of our local Peregrines and their behaviour, you don’t need a Zoology degree or any kind of training and you don’t necessarily need fancy expensive equipment. Simple information such as times and places build up to form knowledge – Citizen Science. Your information is as valuable as the next person’s and we are building this knowledge together, in real time. It’s with great anticipation that we look forward to the 2019 breeding season. Who knows what it will bring? Hopefully not the freezing cold the birds endured during March and into April last year, incubating eggs surrounded by, and covered in, a couple of inches of snow! That they took all that in their stride and still successfully fledged three chicks only goes to underline how amazing these birds are and how lucky we are to have them living amongst us here in Sheffield. It’s been a cracking afternoon in Sheffield – literally – as the first egg has hatched. This was my first glimpse of a chick, at 19:13, although it had looked all day as if something was happening, right on time. A handover a little later allowed for a clearer view, and confirmation that there was one chick alongside three eggs. Thirty-two days have now passed since the last egg was laid, since when round-the-clock incubation has been a constant, and in each of the years for which we have data from the webcam, the gap between last egg laid and first chick hatched has been either 31 days (2016 and 2017) or 32 (2013, 2014, 2015 and now 2018). And in every year, the chicks have hatched within one or two days of each other, so things should move quickly overnight and tomorrow: worth watching! The screengrab above shows that at 13:52 this afternoon there were still four eggs, one of which appeared to show (in the white patch visible on the front left egg) the first signs of ‘pipping’ as the chick began to break out of its shell. The enlarged image below makes it a little easier to see. As in previous years, the adults adopted a tell-tale ‘eggs-to-chicks’ posture while on the eggs, tilted forwards and hunched. They do this by resting their wings on the ground so as to hold their body partly off the eggs to allow for the emerging chick, as below. A look back to last year reminded me that the night before the first egg hatched in 2017 saw temperatures fall down to just one degree above freezing, and while last night in Sheffield saw a comparatively (!) balmy 3 degrees celsius, conditions are far from ideal. Fortunately, the chicks seem to be pretty hardy on the basis of previous years and temperatures look set to rise over the next few days, although Wednesday – likely to be the first full day with our complement of chicks, however many that may be – is forecast to be very wet. No doubt the parents will brood them carefully, doing all they can to keep them warm and dry, although handovers will see them get unavoidably damp. Above is what I expect to be the final handover of the day as the female took over duties for the night at 20:41. You can make out a second ‘pipped’ egg, which should mean a second chick by tomorrow morning. Over recent years it’s become apparent that chicks often emerge from their egg at night, so let’s see what the morning brings. Tomorrow morning should also see the first feed brought in, so another thing to watch out for. Yesterday the BBC showed again their engaging documentary following the lives of a family of Peregrines in Chicago as they hatched and fledged. No doubt you can catch it on iPlayer if you missed it – or you can watch it all unfold live right here in Sheffield.